Now I am going to harden the tip. It is really not too hard. The first thing I like to do is get everything together that I will need before hand. The torch, oil, vise grip, magnet and awl blade. 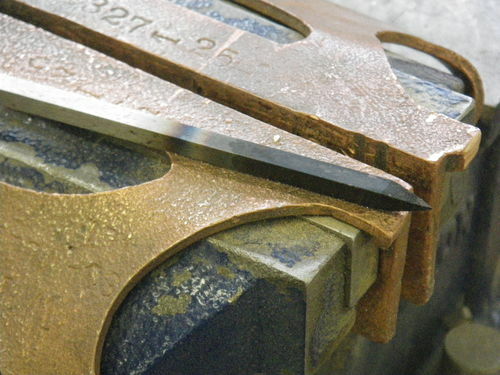 O1 tool steel is meant to be quenched in oil, that is what the “O” in O1 stands for. I use used motor oil, why, because it is cheap and has carbon in it. I have also used canola oil successfully. I put the awl blade in a vise grip so that I can pick it up quickly and dunk it into the oil when the steel reaches the critical temperature. I have an empty steel can with motor oil in it nearby and the torch is ready. I use MAPP gas, propane will work as well, but take longer. I am heating it up here and you can see the steel starting to get a reddish hue. 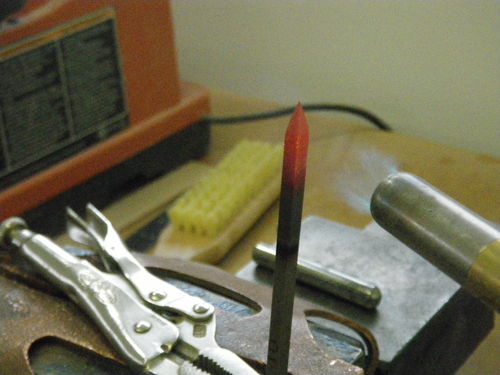 I heat the steel until it is cherry red. It gets an inner glow almost like there is a light inside. At that point the steel will lose its magnetism. 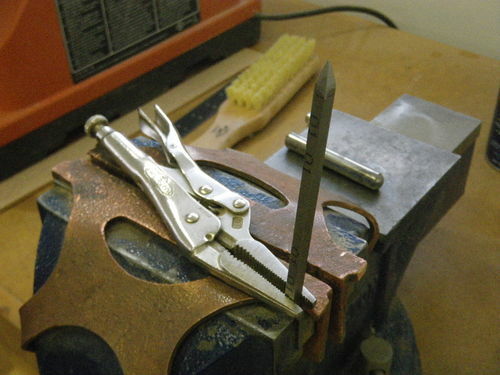 I always keep a magnet attached to my vise so I can test this. You can see the cow magnet sitting on my vise. 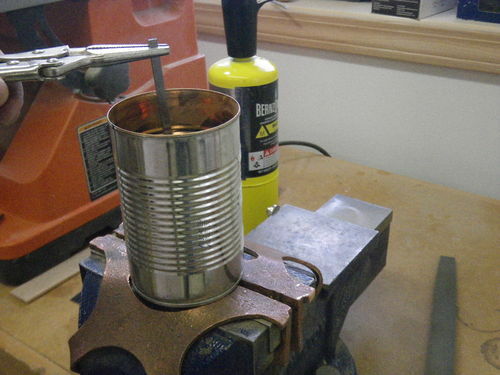 I then immediately pick it up by the vise grip and plunge it into the can of oil. This is what it looks like after the plunge. I only harden the tip. I don’t think it is necessary to harden the whole length as an inch or two of hardened length will last longer than I will. The steel at this point will be very hard but also quite brittle. 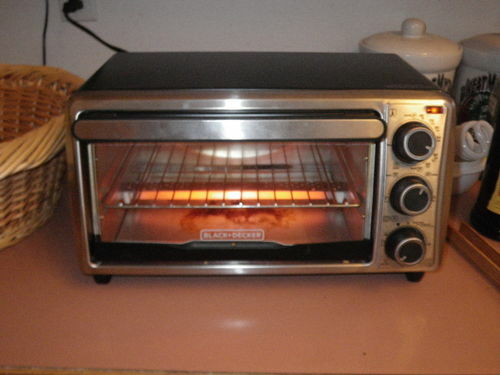 To toughen it up I temper it in a toaster oven set at 400°F for 2 hours. I leave it to cool in the oven. Here what it looks like after tempering. Now I clean it up by rubbing it over 320 grit wet/dry paper. That gets rid of the carbon that has built up on the surface and reveals the gleaming hard steel underneath. 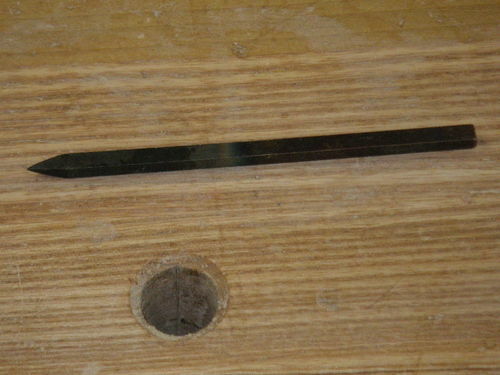 I put a mark on the blade at 2 3/4 inches from the tip. That is my preferred blade length. I have tried longer lengths but I always seem to grab the shorter ones for most uses. The rest of the blade will be buried in the handle. 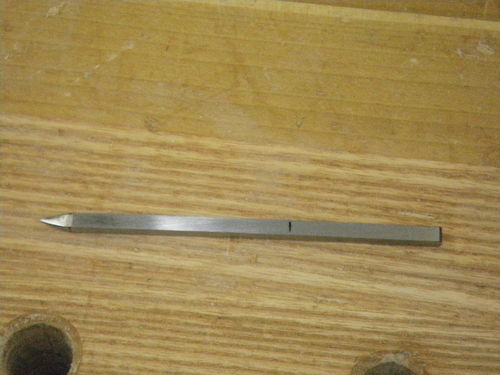 That is what the next entry will cover, making the handle. Thanks Bondo, appreciate the pictorials and good blog! So, when you buy 01 tool steel, it does not come pre hardened? I don’t understand the need for the magnet. Are you saying that you have to heat it until it looses is magnetic properties? Would you expand upon this? Putty, that is correct. It is quite soft as it comes, which makes it much easier to shape. 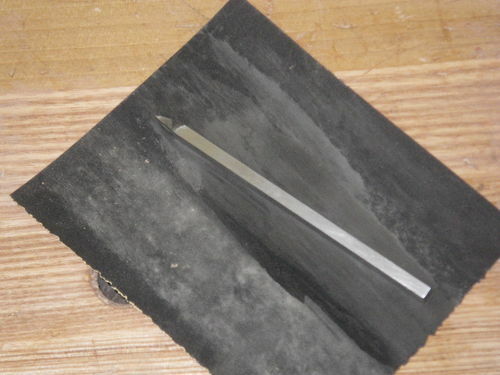 After hardening you would be hard pressed to put a point on it w/ a file. WoodNSawdust, You don’t actually need the magnet, it is just another way to verify that the correct temperature has been reached. Steel when heated to between 1450 and 1500°F will lose its magnetism and will also glow cherry red at that temperature. That is the target temperature for hardening and that is how you know when it is time to quench the steel. Here is an article with a little more about heat treating steel for plane irons, the principal for awls is exactly the same. Nice write up Bondo. So one could do the same thing for a chisel or the like? lateralus819, yes that’s right, it is the same process for chisels, plane irons, anything made w/ O1 steel.